The most important thing for you to do right now is to act with speed and focus. Keep your eyes on the prize! 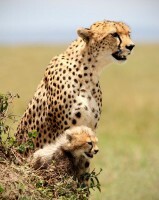 In this case, cheetah symbolism is reminding you that things are moving with great speed for you right now. Therefore you need to keep yourself focused on your direction and your goal. Moreover, it is the best way to find the most direct way of achieving your dreams. Occasionally cheetah meaning is a little more subtle. In other words, it means that you will have to focus on all aspects of a plan. In particular, be a little more flexible in the revisions to attain your goal. Thus you must be clear about your intention and what it is you are trying to create. Alternatively, cheetah symbolism warns you to be aware of spreading yourself a bit too thin. It could be that you are trying to accomplish too much or having too many goals at the same time. For more information on the Big Cats check out our Big Cats Page. The cheetah is also closely related to the lynx, cougar, and jaguar. People with the cheetah totem have a high capacity for empathy and know precisely how to respond to the hurt, pain, and suffering of others. They are fearless in the art of tough love and will tell it exactly as it is. However, they also have a way of saying these things diplomatically so that it removes the “punch” from the delivery. Folks with this spirit animal also respond quickly and instantly to all opportunities as well as the dangers in their lives. They also tend to be solitary and are very choosy as to who they will trust and form a bond. When you have a cheetah dream in which the cat is chasing you suggests that you may need to get up out of that chair and get moving. In other words, be more active in pursuit of your goals. Conversely, the vision could also be letting you know that you cannot outrun your current problems or situation. Therefore, you will not be able to escape them and will have to take action instead. If the animal in your dream is hunting it symbolizes that something is missing in your life. Thus, you somehow feel that you are missing the mark as far as your purpose in life goes. Alternatively, this big cat dream may appear in your life when you are trying to move on, and something keeps bringing you back to the same dilemma. I had a dream last night of Cheetahs chasing me. The first part I don’t remember to many details, but what I do remember is that a single Cheetah was chasing me and I was able to get away. Then I remember that I was in a large crowd of people, like some kind of Festival, or special event. I walked over to some near by apartment buildings were a friend lived. I walked up a flight of stairs, that were located on the outside of the building. From the second floor I could still see the crowd of people. My friend and her family was outside of her apartment to greet me. I turned my back to the staircase, and the crowd. My friend needed to talk, she had told me that she almost committed suicide last night. As I tried to find out why she felt so distressed, something inside me said, turn around. As I did, I saw that all the people, thousands of them were just gone. 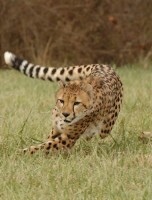 But, running across the stretch of grass, from a distance, coming toward us, was a Cheetah at a high speed. I then thought to myself, this is the second time today, that a Cheetah was chasing me. It was so far away I was sure we could make it inside my friends apartment, just a few feet away. But, I was wrong. Before we could take two steps, the Cheetah was across the field and up the stairs in front of us. Now, It was a question of who the Cheetah would attack first. As the Cheetah moved his head from person to person, in a crouched, attack position the animal fixed his sights on me. He crouched down just a little bit farther, as if to Lunge at me. But, my mind told me to raise my hands gently in front of me. I have brought both my hands slowly up in front of my body, one in front of my chest, and the other across my stomach. Then, I thought to myself I need to protect my face. In doing so, the cheetah raised his body, as if just to stand and look at me. At this point, I knew he was not going to attack me, but I was still afraid. The cheetah and I Look eye-to-eye to one another, there was some kind of strong connection, but I had no clue what. No one was attacked, I had woke up with that cheetah still in my mind looking at me eye-to-eye, as if the cheetah was still standing looking at me in the eye. What does it all mean? It is truly trying to tell me something, and I will pay attention to this warning. I have never dreamed of cheetahs before, until several days ago. I dreamed that 2 cheetahs approached me and my husband from out of the dark. We were afraid of them and tried to make them leave by throwing rocks at them and trying to scare them off. They wouldn’t leave no matter what we did. I was about to try and run away from them and all of a sudden saw one leap up and bite my husband in the neck. I screamed and woke up. I was so glad to awaken from the dream but later on during that day my husband received a very disturbing medical diagnosis at his doctor’s appointment. I realized the dream was a premonition of that. Has anyone else found that their cheetah dream symbolizes something (either beneficial, challenging or mixed?) that is currently going on in their lives, or perhaps something that ended up happening later on? I recently had a dream that a pack of Cheetahs were running toward me as if they were running away from something. Only one stopped and stared at me and gently grabbed my hand with its mouth as if it wanted me to run to. I was scared but didn’t run away. I recently had a dream with a cheetah and an eagle. I was in a very inmense backyard with a big tree in the middle. I was there with a group of 4 very strange individuals, suddenly I saw a cheetah coming down from the tree, my first reaction was to chase it, but for a strange reason i was running on all 4. I chase him to the tree and climb my way up, then I slowly descended back down and returned. He went down again and I chase him again in a very aggresive way, even tough I wasn’t trying to hurt him, suddenly he went more high in the tree where an eagle suddenlt appeared, it then flew to 3 suspending pillars made of wood in the air, each of them where more higher than the other, the next thing I knew I was asking myself how can I ger up there. Whe I came down again, I saw a hologram of a hovercraft, it was the key to get up to the pillars. The next thing I knew is that I woke up and started drawing the mental picture. Two nights ago, I was dreaming that I was with a few other people outside. We were in a yard and preparing to rake it, maybe of leaves or bits. Then, a long, low truck arrived. The many doors opened and 6-7 cheetas each came out. Their eyes were filled with a golden white light glowing from them and around their heads. They were lean and snarling or hungry. I yelled to “get inside” of the long utility room we were close to on the opposite side of the yard, just 30 ft away. I went inside and closed the door very frightened after seeing the intensity of the cheetas, afraid for our lives. Since I didn’t hear my friends, I opened the door a little to see what was going on and where my friends were. And one of the guys had brought out a large animal cage and there was the body of my young brother who had died of AIDS in 1986 at 28. He was already dead and I think my friend was using his body as bait. I was so freaked out and frightened I woke up just after 5 am and could not sleep. So I meditated. I had a dream that we were celebrating some festival in jungle. There were many people of my age group.. suddenly many cheetahs came growling.. I was having torch with me like others. we tried to threaten them . Somehow we were safe and nobody was attached by cheetahs. And especially I was too much ready to fight with cheetah to save the people. What’s the meaning of this dream please tell me. Last night I had a dream…where I was going somewhere with some of my friends.I was behind.Suddenly from the front they told me to either hide or run.I saw a cheetah but it was little bit darkar of shades.It did not saw me but I was frightened by seeing it. Last night I had a dream where I am in a school building and people are running around that there is a an animal (big cat) on loose (i can’t remember the word but it was not a tiger or lion or panther). It was chasing other people but I never encountered it. I saw glimpses of it passing in near distance, and it looked like a cheetah but fatter. There was chaos, i managed to come down many floors without problem but people were freaking out. On ground, outside I saw a room and took shelter with few people who came along, saw the animal in distance going in different direction, as I was about to close the door, i saw people running towards me in panic to get inside, i opened the door and let them in, noticing in distance that those people were being chased by the animal(cheetah but aggressive) now to animal is running tiwards the room. I close the foor and put my force against the door to prevent it from opening and hold it taut to prepare from an anticipated blow from the animal. The animal attacked the door but failed to damage it. Then I realised that there are windows which are high up but are made of glass, the ceiling of room is quite high and the room is packed with people. I remember thinking to myself that I hope these people do not yell in psnic as the animal outside is banging on door, and somehow it was pindrop silence, no one made a sound despite the animal banging outside to break in. After some time the animal finds the windows and breaks the glass and starts to pick people up with jumps from outside to outside across the room. There are a number of cheetahs doing that from different directions,picking people from top,people on top. I am still at the door, holding it and ducked down. And all that seems to be happening far away and above from me in the same room. The animals are aggressive. Nothing​ comes near me and I remember thinking why. What did I do that it didn’t happen and what did those people do that it happened to them and I woke up from the dream. Very wiered dream. Never experienced anything like this in my dreams. New to me. Remembered more details, when cheetahs were attacking people , it slowed down and somehow talepathecally i communicated to people to cover the windows with some board and put pressure on the board to prevent the animals from breaking in and it worked and animals left the windows and moved again to the door and then I had those thoughts, and woke up. In my dream last night, I was walking beside a friendly cheetah that could talk. I had a mission, to save it or at least hide it from evil people. I wasn’t scared of it, nor it of me. We were like companions. What could it mean? I had a dream and very confused as to what it means it was filled with crazy situations for one Im originally from el paso but live in a different state at the time but all of this took place in el paso as far as i seen in my dream anytime i walked through the canals I could see cheetahs all over but a man with a rifle would shoot them he would protect ppl walking on the canals by one cheetah went past the canals and the man was having trouble reloading the gun so I got bit on the hand twice after that it just changed to a different dream. I just had a dreM being beated by a black hungry cheetha while i was travelling in a cage cable car in the air. The hungry black cheetha keep jumping n wana to eat me! He beated my hand n my feet.. minor sketches and bleeding.. then we flea away.. I just woke up from a dream about a cheetah. My mom and I were driving on a dirt road and saw a cheetah cub lying in the road. We went by it and i opened my door and called to it. It paid me no attention. It moved in front of us again and my mom ran over it. It was fine, but it began to chase us and meow for help. I opened my door and it jumped in. We took it to our house, where apparently we kep a lot of animals. We put it in a cage to monitor it. Somehow there was a small whale in the bottom of the cage and it swallowed the cheetah. Some neighbors yelled for us to help. I went out to grab the whale and i pushed the cheetah back out. Unfortunately, the cheetah suffocated. What does this mean? It’s telling me what it means if I had a dream about the cheetah attacking me but I wanna know what it means about it trying to attack my child and I’m fighting it to save her. I once had a dream of a cheetah being adopted into a wolf pack and the son of the alpha male bacame friends with her. Eventually they grew up and then alpha male died. they were both made the leader of the pack the wolfs name was Taya and the wolf pack name the cheetah Sia. Then the word flashed through mind Sataya which is what the leaders where called(and no it is not a ship name😒) .what does this mean? Hi! I know I’ve commented on another animal page before, but I just recently that my spirit animal is one of the big cats. So far, it has been narrowed down to Tiger and Cheetah. Anyway, is it possible to have a Chinese zodiac animal (Tiger) as your spirit animal if you have a different Chinese Zodiac (mine is Dragon). Also, how would I go about finding out if my spirit animal is a Cheetah or Tiger? I’m very drawn to both, but more so to the tiger because it loves water. But I keep going back to the whole “Chinese zodiac thing” I mentioned before. Hello I had a dream about cheetahs as well. Many many of them were running very fast front of me and I was watching them with fascination. They didn’t chase me or anything but then all of a sudden my friend from junior high ( I don’t get to see or talk with her any more) in the dream and I have a bite of cheetah meat – I don’t exactly remember but maybe we she offered the meat not sure though- but before I swallow the meat I spit out because I am vegetarian and in the dream I also say as disgusted ” I cannot eat this I am vegetarian” . It’s just an interesting dream because I also saw it when I fasting for detox for my soul and body for 2 days. Thank you! Burcu, the cheetahs are out hunting for prey, for food. They are moving fast. You try some cheetah meat, the prize of the hunt, and spit it out. You are being asked to swallow some idea or value that is repulsive to you. Be true to yourself. Hello. I had a dream that i I had a pet cheetah and a pet dog or something. They were domesticated and was apart of the family. My house was one of pale green walls. I was busy taking my kids places going and coming frequently. My house was full of people when I suddenly noticed my cheetah and other pet were dying. I had not fed them or something and they were gasping for air. I noticed and began to feed the cheetah Irish sea moss and water. I woke up before I found out if it could recover. What do you feel a dying cheetah means? When my son was 3yrs old he used to have an imaginary friend. He used to say a cheetah followed him around and talked to him. I don’t know where he got this from because he hadn’t seen one on tv or he wasn’t at school yet. It was very strange. I dreamt that I was in a Savannah scenery, it looked so African, wild and incredible. I was waiting, thinking: a cheetah may appear now. But then, a fox appeared, and right after that, a cheetah jumped on the fox’s back, and was trying to bite the fox’s neck. But then it turned out that they were only playing, for the next thing I saw was the fox lying on the ground beside the cheetah, and there was another cheetah as well lying on the ground beside them. I passed them by and walked away those animals were looking at me but were completely harmless, and I climbed a rough, stoney Hill. I went up and up until I got , it seemed, onto the top, and there was a man I had actually encountered a while ago, maybe a year ago, a Poor man. He was in tears, and looked like he was waiting for me. I killed the cheetah in my dream. Any interpretation on that would be appreciated………. I backpacked Africa and when I was there, I was attacked by a Cheetah but it turned out she was just playing (hurt like heck and I was bloody but she started purring) and in another part I had a number butterflies land on me – there were a dozen other people around but they only landed on me. Is it possible to have multiple spirit animals or have them change? Recently I have been having various emotional dreams of cheetahs and I can’t tell if I somehow changed spirit animals, it was once a Fox but the last time I had a dream of a Fox was about a year ago and it was runing away. What does this mean? i recently found out that Native Americans believe that you can have up to 9 different animal guides/ totems. mine has been a cheetah since i was young. and i just realized that the butterfly is also one of them. GOODLUCK! I saw a competition where someone pet chetha killed the daunger pet dogs. Then when i was going to his home he was sitting and resting in ladders as soon as i enters the gate he attack on me i escape on 2nd door as i do close 2nd doors, i saw he is growling on me an his master. I woke up. I saw myself been part of the cheetahs and l don’t understand what it means. I had a vision of a cheetah clapping hands for me but l don’t know what it means? I don’t remember the exact time or date when it happened, but I always wanted to know what it meant. I was unsure where to look it up as this was not a dream. Let me be clear, was NOT a dream. Hopefully you can tell me the meaning behind it. Awhile ago, I fell asleep in the living room(In my favorite chair) and I woke up early morning. As soon as I opened my eyes and looked to my right, I saw a Cheetah sitting on it’s hind legs just staring at me. It’s full body and head. It scared the crap out me, but I guess anything that you see unexpectingly when you wake up would do that. I remember freaking out and then closing my eyes hoping that it was a dream, but I knew it wasn’t. No lights were on and the television was off. The only thing that was emitting light was the digital clock sitting on the tv stand. When I opened them again, the Cheetah was gone. This has never happened to me before and has not happened since. I have nothing, but 3 feet of open space between the chair and the wall. So nothing could cause any sort of matrixing. I hope you can give me the meaning behind this. If you this actually happened, then you spirit animal is most likely the cheetah. The old myth is if a cheetah crosses your path (which most likely won’t happen unless you live in the Savannah) or if you have a dream about it, then it is your spirit animal. If you do not choose to believe the old myth, then look at the charecteristics of the cheetah. Do they match any of yours? I can’t tell you the exact meaning but hallucinations happen from drug exposure, stress, lack of sleep, ECT. I’m guessing some spirit was sending you a message. And cheetahs are a good sign. And around this time if you have any life plans starting its telling you to move forward. Someone is on your side. Your dream is telling you that you are in the right state of mind and people are trying to stop you. Goats can represent evil. Hey , earlier today i had a dream of a cheetah in my house. I was completely sure of it because i seen it, but i was to scared to follow it. In the dream i fell asleep and noticed a head between my legs and i felt it and i knew it was a cheetah my body froze and i tried to wake up from the sleep i was in, in the dream but it was impossible. The second time i seen the cheetah it was in the house but it never hurt me or my nephews, and my nephews we’re running around it just stared at me and disappeared. At this point i woke up. What does this mean? I Would like to know asap ! It means your running from your dreams. Although its scary to follow your highest potentials, your instincts are telling you it wont hurt. I was sleeping walking… Walked into my room mates room which woke him… I sat on his floor. He was telling me to get up and go to bed .. Knowing of course that i sleep walk…. At one point he stood over me and and told me to get up and get in my bed… My response was appearantly to scream loudly 4 times…. I was still fast asleep through this. He said that i then stood up and went to leave his room, but turned around and looked him dead in the eye and declared “I am not a leopard. I am a cheetah” …. Wonder what i was dreaming of at the time. I have no recollection of this incident. This morning I prepared myelf for deep meditation. I used 4 candles for the 4 directions, I lit some incense called the 4 elements and I placed crystals on each chakra and focused on my breathing and getting releaxed. I seen a cheetah and a tiger and then a domestic cat. This website is super helpful and the message this gives me is astonishing!!! thank you so much! I had a dream that me and several friends were walking through a forest trying to get to a specific destination. We came to a cliff and saw we were very close. One friend said it would be easier to just jump from the cliff and swim while the rest thought it would be safer to walk around (even though it would take longer). So we all started walking but the one friend ran and jumped off the cliff (barely missing a rock) and began to swim. We all noticed a cheetah by her and tried yelling and screaming to get her attention so she could protect herself. When we couldn’t, I jumped and the rest followed. The cheetah turned its attention on us and began attacking. We fought back and were close to killing it when guilt overwhelmed me. I was scared to let it go but also couldn’t keep hurting it. What the heck does this mean? The dark side of the force, according to Yoda, is the quicker and easier way…the jumping off of the cliff is a representation of that which seems to be quicker and easier but in reality…it leads to constant inner struggle just to stay alive. Had a dream last night a cheetah was in my house. Never harmed me. Just acted like a domestic cat. But, I do remember that I had a feeling that it could turn on me and my kids. When my kids were running around the house, it would kind of go towards them, never hurt them, but I remember feeling in my dream that it could. What does dreaming of this cheetah mean? Cheetah in your house around your beloved family, you put it there to protect them. You have respect not only for the Cheetah’s speed, but for what appears to be the noble bearing of the animal, it is a loner, and hunts only when it needs to eat. The Cheetah perhaps also symbolizes your projection of YOU, wanting to be that noble, spirit filled animal who is a protector and provider, and also to be respected for your character. The Cheetah has been my spirit guide since I was a little girl. I’ve always felt a deep connection, and even have dreams of being a cheetah mother and hunting for her cubs. I always knew that it held a special meaning, but I always look to the cheetah for guidance in a situation that seems out of my control. I came from a Souix tribe and my spirit animal is a cheetah not because it chased me. At a very young age I wished to grow up like most children do and I did at a very young age all things happend so fast and the cheetah has been there for me and the things that discribe a cat and cheetah describe me exept he is in the form of a cheetah. He comes to me when I need him. Btw I’m going through hard times. Soñé con una chita grande bonita brillante y como flechas en la cabeza v algo así… Me miraba al lado de un león un poco viejo… Supe intuitiva mente q era mi tótem …. Pero quería saber q significa…. Muchas gracias…. I recently had a daydream/vision of a cheetah running with a butterfly in the African savanna. Later on in the dream a Hummingbird flew with the cheetah and the butterfly and they came up to me and bowed at me in respect.I bowed back at them. It was a wonderful sight! I have meditated before on the intent of finding my spirit guide, and I saw a cheetah. The Cheetah told me he was my spirit guide. I regret it now, but I didn’t do anything to see the cheetah again. The reason why I didn’t try and see him again is that I was confused that the Butterfly could’ve been my spirit guide. I see the beautiful insect everywhere when I’m awake. I receive boxes with butterflies on it, see paintings of them, I see them everywhere. I was even called ‘the butterfly whisperer’ when I was younger because I had a butterflies land on me and they seemed to refuse to get off. The other day I was meditating and I woke up in a forest. Then a small, female hummingbird came up and landed on my finger and told me it was my spirit guide. Since I had this vision of all three of the running together I’m awfully baffled. I was just wondering if you could shed some light on this? Hello Mel: You can have more than one spirit guide. I would study all three and discover as much information about them as possible. The good and the shadow aspects and try and incorporate their teaching into your everyday life. All three are amazing Totems. You have 3 guides and you can pull them out one at any time. keep meditating and visualize the one you resonate with most, that it be the Butterfly, Cheetah, or Hummingbird and when it comes ask the Name of that guide. Once you get that name embrace and embody it it. It will become YOU. and do this for the other TWO also. Always have discernment of spirits. here is how you do that. Meditation, The Lords prayer Our Father prayer, detach religion and dogma 🙁 from the prayer and then Ask the spirits to revile their name and Purpose to Serve you in your Journey.